BentoLunch.net - What's for lunch at our house: More Christmas Bento, This Time with Cookies! 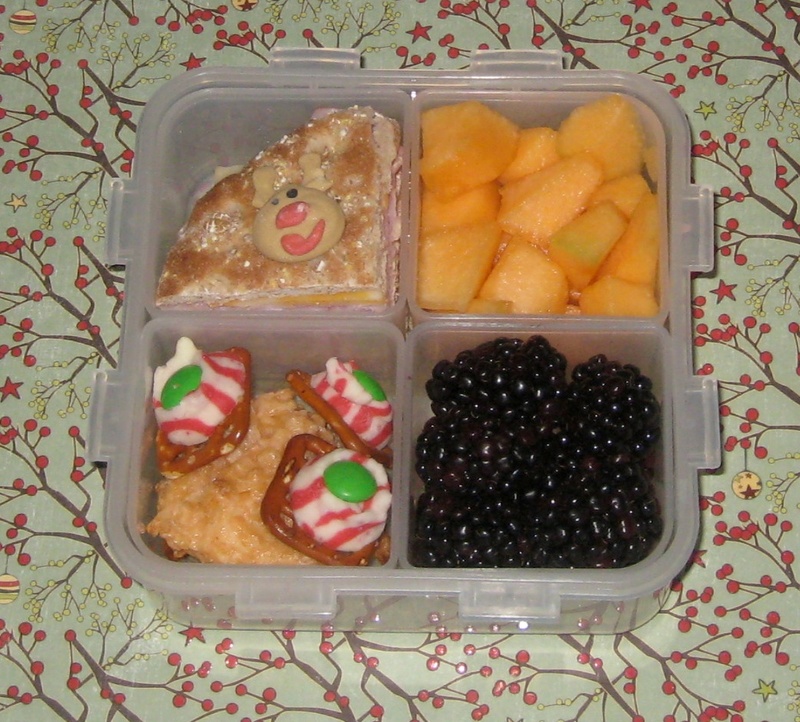 More Christmas Bento, This Time with Cookies! We started doing a little Christmas baking yesterday! So far, we made Zebra Nibbles (pretzels with Candy Cane Kisses and M&Ms), orange sherbet macaroons, chocolate almond fudge, and gingerbread reindeer (pretzel antlers and M&M eyes and noses). Of course, there's no sense in making these if a couple don't make it into lunches! Ben had a ham and cheese sandwich on multigrain rounds, quartered to fit in his container and topped with a sugar reindeer. For sides, he had a couple of the macaroons and a couple of the zebra nibbles, plus cantaloupe and blackberries, all packed in a 4-square Lock & Lock. The stupid refrigerator froze my cucumber, so I need to buy more veggies.